So why this title; “Fifty shades of grey in Religion & Art”? Perhaps something to do with the painting of the cats and all the shades of grey they come in. Well not exactly but as it is Christmas I thought this painting was a good fit even though it is not a religious artwork, which really is the topic of this art blog. You see I recently wrote a blog about Fifty Shades of Grey & Art about the book phenomenon and my thoughts on the matter and as I got hundreds of messages, comments and feedback on that I thought it was worthwhile to canvas the issue that was brought up time and time again. 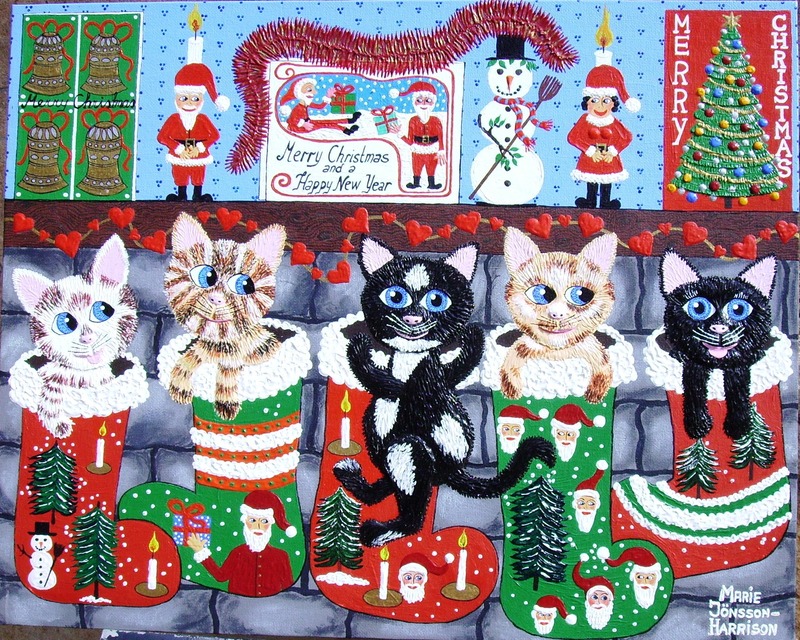 Most of the comments were really positive and some 160 people shared the initial post from my Naive Art by Marie Jonsson-Harrison page on Facebook with over 1680 likes. The thing was that I had posted the blog with an artwork of mine made in ceramic and mosaic, a wall based sculpture depicting Adam and Eve and that caused some heated debate both from the Christian side as well as from the Muslims. Some Christians thought it was an outrageous artwork and that Adam had a bottle in his hand was terrible. 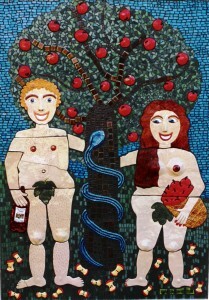 That to me seemed a weird comment as I am sure both Adam and Eve had a drink, let’s get serious they would have gotten bored just eating those apples without making some apple wine or schnapps occasionally right? The bible is all for alcohol anyway that is what every Christian church gives their followers on a Sunday morning, in the guise of the “blood of Jesus”. That I had painted them a little bit plump which was for the most part approved of. Apple juice may be fine, but we rather have a wine! As far as the Muslim comments go, again for the most part the artwork was met with great comments and positive feedback however there were some that took offence and thought it was outrageous and anti Muslim! So go figure if both Christians and Muslim think it is against their particular religion then I must have done something right I figure. Which brings me to the question of religion and the fervor it stirs up in people, seems to me that all that matters is that their own point of view is right. Why can’t everyone just believe in whatever religion that makes sense to them? Whether that is Christian, Muslim, Jewish, Hindi, Budda or none and be an Atheist. Why does it matter so much to some people what other faiths people believe in? How do we even know for sure that there is a God? I hope there is one; I do want to go to Heaven if there is such a thing. I do believe in doing onto others and all that. But in this evidence based world I just cannot say for sure what is true and what is fiction. So until we get word from above as to who is running this show and what particular religion is right, let’s just try to live together and in harmony with each other. 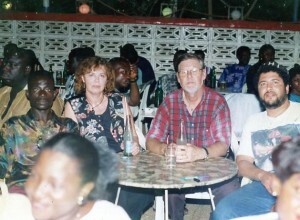 My cousin Sonja sent me this picture from her time in Accra, Ghana. It shows one of their favorite dancing spots where all sorts of people gather to have fun. To the right is a Jew and to the left a Muslim, then there is two Atheists and behind are some Christians and they all had a great time together, that is the type of world I wish for. Let me take this opportunity to wish you all a Very Happy Christmas or Happy Holidays and Happy New Year to everyone apart from the Chinese (which has their New Years a bit later). I hope you are all able to spend some time with your loved ones, for that is really all that matters after all. I think he has a fair point.